Book Cellar Gaper's Block Book Club reads from Passing. Nella Larsen was born in Chicago to a black father and a white Danish emigrant mother. Her father died when she was young and her mother remarried and had another daughter. Most of the rest of her early life is unknown. She trained as a nurse and as a librarian, and married Elmer Imes, a physicist then living in New York City. She became a celebrated novelist and writer of the Harlem Renaissance, beginning with her 1928 novel, Quicksand. It was followed by Passing (1929). The couple were members of a circle of professionals, intellectuals, and artists that included Langston Hughes and W.E.B. Du Bois. Nella Larsen won a Guggenheim Fellowship in 1930, intending to write more novels, but never did. By 1938, she and her husband were divorced and she was no longer in touch with her friends or her publishers. She took nursing jobs beginning in 1944 and lived a solitary life for the next 20 years until her death. 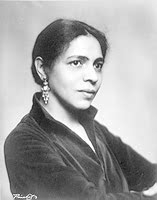 Nella Larsen is currently considered a "single author." If one or more works are by a distinct, homonymous authors, go ahead and split the author. Nella Larsen is composed of 3 names. You can examine and separate out names.